Client1 is not a required component. In our sample setup, it is used for bundling images and for using as a client for web interface and to run euca commands for managing the infrastructure. Having this client ensures that you do not need to meddle with the servers for tasks such as bundling. Also, bundling of Desktop Systems including Windows will require GUI and it is better to have a dedicated machine for this purpose. We would recommend this machine to be VT-Enabled so that KVM can be run and Windows VMs can be run during image creation for bundling. The installation steps use certain specifics such as hostnames/IP addresses etc. Modify them to suit your environment before using them. The following table summarizes these specifics. Boot the server off the Ubuntu server 11.04 CD. At the graphical menu select Install Ubuntu server and proceed with basic installation steps. We will also be running nova-volume on this server and it is ideal to have a dedicated partition for the use of nova-volume. So, ensure that you choose manual partitioning scheme while installing Ubuntu Server and create a dedicated partition with adequate amount of space for this purpose. We have referred to this partition in the rest of the chapter as /dev/sda6. You can substitute the correct device name of this dedciated partition based on your local setup while following the instructions. Also ensure that the parition type is set as Linux LVM ( 8e ) using fdisk either during install or immediately after installation is over. Create the first user with the name ‘localadmin’ . Installation lets you setup the IP address for the first interface i.e. eth0. Set the IP address details. During installation select only Openssh-server in the packages menu. Nova and Glance have been included in Universe repository . Enable Universe repository in your /etc/apt/sources.list. Update the machine using the following commands. Reboot the server and login as the admin user(localadmin) created during the OS installation. Install NTP package. This server is going to act as an NTP server for the nodes. The time on all components of OpenStack will have to be in sync. We can run NTP server on this and have other components sync to it. Glance is an image Server that Nova can use to pickup images from. Glance is very modular and can use several types of storage backends such as filestore, s3 etc. We are installing Glance before installing Nova, so that when we get to configuring Nova, glance is ready to be used by Nova. The default config file at /etc/glance/glance.conf is good to use for a simple file store as the storage backend. Glance can be configured to use other storage backends such as swift. This will be covered in more detail in the chapter on “Image Management”. Glance has two components – glance-api and glance-registry. These can be controlled using the concerned upstart jobs. Restart mysql server to ensure that it starts listening on all interfaces. If you did not set the mysql root password during installation, set it now. Create a database named nova. Update the database to grant super user privileges for root user to login from any IP. sudo mysql -uroot -p$MYSQL_PASS -e "GRANT ALL PRIVILEGES ON *. * TO 'root'@'%' WITH GRANT OPTION;"
Set mysql root password for login from any IP. sudo mysql -uroot -p$MYSQL_PASS -e "SET PASSWORD FOR 'root'@'%' = PASSWORD('$MYSQL_PASS');"
Install the messaging queue server, RabbitMQ and various nova components. Install euca2ools package for command line tools to interact with nova. Install unzip for extracting archives. Edit the /etc/nova/nova.conf file to look like this. Create a Volume Group named. Create a group called “nova”. Restart all the nova related services. Create nova schema in the Mysql Database. Create a list of Ips to be used from the network of fixed Ips set inside nova.conf. Allocate 32 Pubic IP addresses for use with the instances starting from 10.10.10.225. Create a user with admin rights on nova. Create a project named proj. Create a directory to download nova credentials and download the zip file. Generate and save credentials for accessing/managing the nova cloud. Contents of novacreds.zip are required to use euca2ools to manage the cloud infrastructure and you will need to transfer this zip file to any machine from where you want to run the commands from euca2ools. We will be using these credentials from client1 as well. Navigate in to the folder created and extract the files and change their ownership. novarc contains several environmental variables including your nova credentials to be set before you can use the commands from euca2ools such euca-describe-images, euca-describe-instances etc. these variables can be set by sourcing novarc file. If you see something like the following with all components happy, it means that the set up is ready to be used. OpenStack-dashboard is a web interface for managing users, user credentials, key pairs, images, instances etc. Install bazaar version control system to fetch required software from the repository at launchpad. You have already finished setting up credentials for a user called localadmin in the Nova configuration section above. The credentials of this user will need to embedded into the dashboard’s configuration file. Checkout the source of OpenStack-dashboard from bzr and run run_tests.sh, which does not only test the installation, but also installs several dependencies of the dashboard. Since you are trying to checkout from bzr anonymously, a message saying “You have not informed bzr of your Launchpad ID…” is displayed. You can safely ignore that. Edit /opt/osdb/openstack-dashboard/local/local_settings.py to include certain details required for connecting to nova-api. A simple way of doing this will be to copy the relevant lines from novarc file that we discussed above. In order to to have mails generated by OpenStack dashboard delivered, we need to configure dashboard with the details of an smtp server by editing local_settings.py file. Create a openstack-dashboard database and its schema with the syncdb command. Provide the name/email address/desired password of the administrative user when prompted. While creating the schema, the above command asks you to create an admin account for the dashboard. Choose the user name as the project admin’s user name you chose above while creating the project ( novadmin in our case). You can choose any password you like. You should be able to login as “novaadmin” using the password chosen above. Any other user trying to access the interface for the first time, will need to sign up and will be able to use the interface after the account is approved by the administrator. A successful login and display of the project named “proj” on the dashboard will indicate that the dashboard has been setup successfully. Dashboard uses sqllite database by default. For a production use, MySQL or PostgreSQL may be more preferable. The procedure for MySQL is given below. Procedure for PostgreSQL will be very similar. Activate virtualenv and install mysql-python package inside the virtual environment of Dashboard. While the webserver that is included in Django is good for testing, for production use, it is recommended to use a web server like Apache with mod_wsgi. Install apache2 and wsgi module. Dashboard includes a file django.wsgi(/opt/osdb/openstack-dashboard/dashboard/wsgi/django.wsgi) to help in running dashboard under Apache with WSGI. You can replace the default file with the file below. #we are adding virtual enviornment path. Open the file /etc/ntp.conf and add the following line to sync to server1. Install the nova-components and dependencies. As mentioned above, this is a desktop installation of Natty to be used for tasks such as bundling of images. It will also be used for managing the cloud infrastructure using euca2ools. The output should be similar to what is shown above in the configuration section for server1. What is an Enterprise Name Server? It is just the DNS server that you use in your organization. Finally run ‘sudo sh run_tests.sh’ and continue through the guide. We can also run sudo apt-get install python-virtualenv for the same. Need to add ‘sudo’ to commands in ‘Install python-dev and libhmysqlclient-dev’ section. APT requires knowledge of where to acquire the packages, no? So then would we not need to add to the repos list? nova, glance and swift are in Universe repository for Natty. Just added a line in the chapter suggesting enabling universe repository. This is a great guide, I’d love to find a way to publish it through the OpenStack channels as well. Would you be interested? Sure. That would be great. I am mailing you on this. After having some initial success with Openstack Single Server setup I found your guide and started using it immediately. Thanks for such an extensive guide. Though I would need your help in understanding few things from what I have read your guide so far. 1) Your guide mentions installation of Glance Image Service , I do not see any glance commands used in the entire guide though. As far as my knowledge on openstack goes. Glance and Openstack-nova-objectsore are two different things. When euca-describe-images command is used it is related to Openstack-nova-objectsore and euca-bundle* commands use/needs Openstack-nova-objectsore. So I wonder how glance is coming into picture in this guide. I am a openstack novice and I seek your suggestions. Please correct me if I am wrong. 2) Even after following the image creation steps as per your guide and after creating images, I am unable to upload the images into openstack …. while I am able to use uec tty and maveric images fine in my existing setup. Images are either in untarring or unavailable state. By default, the OpenStack Cloud setup uses the local image store for providing the images to the compute node. If the setup has two or more compute nodes, Glance is necessary for providing the machine images to the other compute nodes. We recommend you to install and use Glance before trying to bundle the images. This is the first time I am using Glance, and I would dig more into it as you have suggested. Looking into my second question above, I get no boot device found error when I use the images that I have created as the guide. Please suggest me. The ttyuec image is working fine. I want to have my own linux and windows images running. I’m assuming that you are trying to bundle an Ubuntu image. During the installation of Ubuntu, select ‘Guided Partioning’ and make sure that you create a single ext4 partition mounted on ‘/’, the error about swap partition can be ignored. My guess is that you are going wrong in extracting the ext4 partition. Each server should it necessarily have two physical network cards? The second NIC is not mandatory, But it helps to keep the connections between the OpenStack components private. Have you more information about configuring hybridfox (region and credentials)? Finally we have Openstack in Hybridfox. Yes, but you need to take this with some pinch of salt, there are some error that might prop up when you traverse to tab’s since Openstack still does not have support for the functionality in those tabs. But we have tried to reduce the ugliness of those error. but it still does not! endpoint URL http://host:8773/services/Cloud or /services/Eucalyptus ? Thank you very much. Fixed it. Thank you for a great document. it should say apache2 not apace2. (well, it shows a bunch of stuff, but that’s the main error). Never mind- got it working. Hi would u mind telling me how u solved this issue? Can you please mention how you solved it so that we can add it to the guide if it is going to be relevant for everyone. This, hopefully, is an embarrassingly simple question. I have a single server tied into the corp DHCP via a single eth. It dispenses ip addresses in the realm of 10.51.10.0 It also does 10.51.11.0. I tried the Cactus simple shell script but, frankly, got somewhat intimidated by the CIDR questions. I want to do an ‘all in one’ nova node but am unsure of what networking address to specify. I would guess flat non-dhcp but it would be nice if the existing dhcp server could assign the public addresses but I need the main eth0 address in order to shell into the box so my understanding is I have to use flat. Does that imply I need to have the network guys carve out a range for me alone? If I added a second nova compute only server I would exceed my allocated range perhaps. So advice would be most welcome. Why does Server2 have a connection to the 10.10.10.0/24 network? This connection is not in the picture and Eucalyptus guides don’t use this network connection either. In “OpenStack Dashboard with Mysql Database” the nova@localhost user also needs ALTER and INDEX rights on the dashboarddb database. As I understand from your article on server2 uses KVM as hypervisor, but I don’t found any instructions for installing qemu-kvm on this server, only on Client1. It should be installed as dependencies or I must do it manually? It gets installed as a dependency with nova-compute. Seems like setting up the MySQL DB have some error. You do “GRANT PRIVILEGES” and “SET PASSWORDS” for root, although it must be for nova user. Could you give some more information about the errors you are referring to. I only ran into trouble when I moved the Dashboard database from sqlite to MySQL. For that to work you’ll need to add ALTER and INDEX rights to the nova user. As for your remark about de user used by nova, it really is root as you can see in the /etc/nova/nova.conf. I agree that using a “nova” user would be much better. We are using separate database for openstack configuration and openstack-dashboard configuration. Yes, but the database user for both databases is odd. We should not use the root user for any database. The nova user should probably be for the nova database. And we probably need a dashboard user for the dashboard database. In /etc/nova/nova.conf on server2, the –state_path option is set twice. Also is there a reason for using 10.10.10.2 and not 192.168.3.1 in –s3_host, –ec2_url and –sql_connection? In the client configuration part the name of the credentials file should be novacreds.zip. Thanks for the correction. Its fixed. 1. -s3_host refers to nova-object store service which needs to be connected from external networks. Hence it should be configured with public IP. 2. -ec2_url is the endpoint URL that is to be used by the client machines and tools to connect to the OpenStack cloud. 3. -sql_connection needs public IP because it should be accessible from clients to connect to the databases. I know what the services are for, bur shouldn’t all traffic between server1 and server2 use the service network 192.168.3.0/24 and not the public network 10.10.10.0/24? For example, the database is on server1, we changed the bind address of mysql to 0.0.0.0. This means it listens on le0, eth0 and eth1. The IP-addres of eth1 is 192.168.3.1. So changing the -sql_connection parameter on server2 to 192.168.3.1 should be ok? Great instructions!! The best I have seen yet. Taking time for me to get my head around what all the components do, but I am getting there. Just wondering if nova-volume should be running on the on the nova-compute server as well as on the cloud controller? Great instructions! !Thank you and your team. I just Install this as you say,and i can see the ‘openstack bashboard’. but i can not sign in use ‘novaadmin’ and can not register as a new user. what can i do, what wrong with it? i am a new one. maybe the question is stupid. i am so sorry. In the Dashboard section on installation and configuration chapter during syncdb, you have to assign password. Please use the same password to login to the dashboard. When digging a bit deeper in the nova.conf settings, I noticed two mayor issues in the nova.conf you published. However it is unclear to me what they mean by ‘dmz’. I added both to the server1 configuration with the address assigned to eth1. On server2 all the services use the 192.168.3.1 address to connect to server1. This works fine. I also noticed a problem with novarc, novarc incorrectly assumes the certificate files to be in the users home directory and not the creds directory. I ran into this problem when I tried to publish an image from the client. I’m going thru the install procedure ([OpenStack Beginner’s Guide for Ubunua 11.04] – installation and configuration) and when I restarted all the nova related services, I got the following error message “restart: Unknown instance” for nova-volume, glance-api and glance-registry. I’ve followed all the instructions as documented, everything was OK up until this point. Can someone please advise me whats wrong ? e.g. stop libvirt-bin ; start libvirt-bin. The restart(8) utility is also available. gets a run_tests.sh of length zero. Openstack-Dashboard is a rapidly developing project. We have rested it on version 46 of it. In the first table, the DNS in the table for server 1,server 2 and client 1 is 10.10.10.3. But in the example where to configure the /etc/network/interfaces file, for eth0, it used 10.10.10.100. To be consistence, I think we should change the DNS in table to 10.10.10.100. Openstack-Dashboard project is rapidly evolving. The latest versions are now also available on Launchpad. In our book we have used version 46 of it. How to configure a multiple cloud controller containing multiple controller services on multiple nodes, multiple instance of database servers, multiple RabbitMQ server, multiple API server and Messaging server. > Create a list of Ips to be used from the network of fixed Ips set inside nova.conf. I’m guessing that these become the private addresses assigned to VMs, but it’s not clear from inspection. >Allocate 32 Pubic IP addresses for use with the instances starting from 10.10.10.225. The OpenStack Dashboard code base has moved to GitHub. There was no existing commented block to fill in, as was the case for the email settings. If that’s correct it may be worth noting that. when running openstack-dashboard, I get the login screen, I don’t get an error after filling in credentials, but I don’t leave the credentials screen either — and I get no log entries indicating that the dashboard is talking to nova. We have tested our documentation on the OpenStack-dashboard version 46 which is available on Launchpad. Nice tutorial, well I have question about the multiple cloud controller. How to configure as multiple cloud controller containing controller services, database servers, RabbitMQ server, API server and Messaging server. How to scale out mysql database server with multiple server nodes. Also not seeing documentations on swift storage installation in “3. Image Management”. For some reason, I only have two files in /opt/osdb. One is README and the other an empty run_tests.sh. Consequently, I couldn’t run the tests and cd to openstack-dashboard…etc. I would appreciate any input. Thank you in advance. Openstack-Dashboard project is rapidly evolving, please use with revision 46 as we have tested it with that. Thank you for a great install guide. I’m not sure what I am doing wrong as the only password that dashboard will accept for the super user account while setting up the database is the access key for the base project. Additionally, I’m not able to create a new user or project from the dashboard. What am I doing wrong? Ok, my inability to set an initial password that was different from the project access key was due to having the $NOVA_CERT environment variable set up incorrectly. I was wondering if it is necessary to have two ethernet cards for successful installation of Nova and network management ? hi, i am working with single sever, and my instance has runing ,but i can’t ping my instance ip ,do you have any idea? when I was checking the installation with euca-describe-availability-zones verbose everything was running fine except nova-volume was not there. So what could be possibly wrong? As I have one NIC in my pc, so I’ve change the setting a little. Once the virbr0 (192.168.122.0) interface is installed, it seems to block any access to the internet (while local network access is still possible). Are there any additional routing steps I should follow? I second M Vincent, same issue. can’t see “through” my gateway anymore even though it’s still configured the same way, after I get a virbr0 network device Still have access to the local ip, dns, etc. First of…THUMBS UP for such an excellent series of articles! sudo /etc/init.d/apache2 reload, I went to check out Dashboard and got the following error page. Me has not permission to this dir? Thanks! and try accessing the dashboard again? Worked like a charm. Ya da man! Moving on to Server2. Thanks! Server1 completed. Moved on to Server2. Did everything described in the article plus moving the zip file over and source novarc. Below is what I got. Not seeing the smiley on Serve2…is the server sad? Hello? Anybody? How do you make sure the second server is enabled here? Thanks! Ummm…a rather stupid mistake. Please disregard previous question. First of all, this is the best set of instructions I’ve found. I have everything installed and working with 1 main controller and 2 compute nodes. I can start instances etc. but I can’t reach them either from internal or external ip addresses (I have a 64 ip subnet of public ip addresses attached to my setup). Each node has 2 nic’s and I have one connected to the public ip switch and another to a private switch. I am also trying to use flatdhcp networking. I’ve tried a lot of configurations for several days, and nothing works yet. Any tips? Could someone please guide how to resolve this? Also, a stupid question, but can i move ahead with further steps and correct this later? I have a similar problem with Steve Jacobs. Except all my instances are in a shutdown state. I was able to ping all the live private IP’s (192.168.3.x) before, but no longer able to do so somewhere after publishing the images. Also, I notice the fixed range is 192.168.0.0/16. Is there a particular reason for that? BTW, my test environment is completely in a VirtualBox environment. Your virtual machines will run very slow, but QEMU is an emulator, not a hypervisor, so it will work. i cant register new user throught the dashboard, anyone else has this problem ? Fantastic guide but I’m stuck already. Ok, how exactly do you do this. I know how to edit the file but I am at a loss as to “enable Universe repository” as there are over a dozen repositories listed. Any recommendations you can provide on the above will be sincerely appreciated. First I’ed like to congratulate the people that wrote this OpenStack Guide for Beginners. 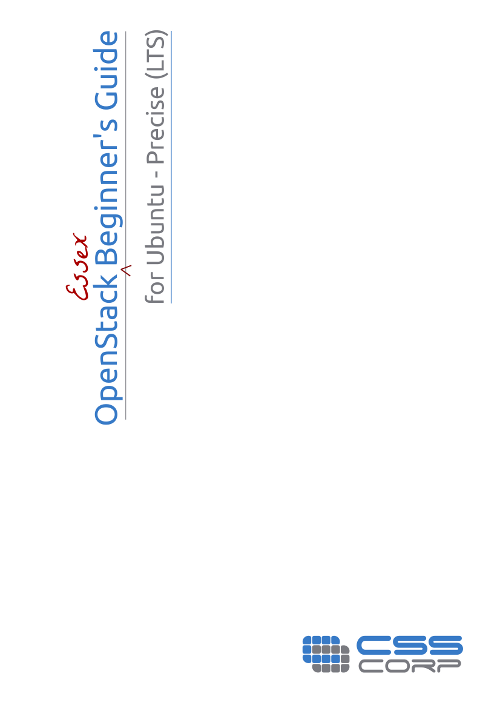 It is really the best installation guide I have found thus far for OpenStack. I did run into some issues which I will document here but they are a lot less than anyother documentation I have run into. I started with a fresh download of Ubunty Server 11.04. For whatever reason the networking, both DHCP and STATIC configurations simply do not work. I tried it on two different machines. So I used my trusty 10.04, upgraded it to 10.10 and then upgraded it again to 11.04. From there on in things seemed to go much better. First, the error with installing the bridge-utils was no more. OpenStack in section 2.2.6 Create a Physical Volume. At least it didn’t for me. I was doing this in a virtual environment so I simply created a second disk and configured it manually as an LVM partition and then continued with the Guided Partitioning of the first disk. In retrospect I suspect that when you get to the Disk Partition screen you could go to Manual Mode, create a small LVM partition, and then go to back to Guided Partitioning and selec Use Entire Disk. I did not try this but that might work. Recommendation: Upgrade the documentation with a reference to the proper steps to configure the disk Manual so that it has the correct bootable and swap and LVM partitions. Networking: Before you start, make sure you have your networking well thought out on paper with eth0 and eth1 and your IP networks all in place. I created virtual network switches, one using NAT (10.10.10.0) and one using Host-Only (192.168.0.0). The section “Navigate to the folder created and extract the files and change their ownership” the unzip command required me to use “sudo unzip novacreds.zip” instead of just unzip….. Here again, at the section “Restart all the nova related services” the above three services did not start. Which makes sense because some of the other services were not running upon restart. So I did wha every Windows sysadmin would do — I rebooted! And voila all availabilty zones are not running just like the picture in the guide! Well that’s it for now. I’m going to start the Nova Dashboard part of the implementation but wanted to share my experience before going much further. ‘django.db.backends.mysql’ isn’t an available database backend. We are unable to get the open-stack dashboard, please help on this. I’, stuck in Nova dash board configuration. fatal: https://github.com/4P/openstack-dashboard.git/info/refs not found: did you run git update-server-info on the server? I got stuck in configuring the server 2. On a recent Ubuntu install (2012/03/07), iSCSI target support isn’t enabled in the default kernel. Others have had a rougher time with this, but all I had to do was ‘apt-get install iscsitarget-dkms’, which builds and installs the required kernel module.